My dear little ship settled in the water Monday after an almost 2 year absence. 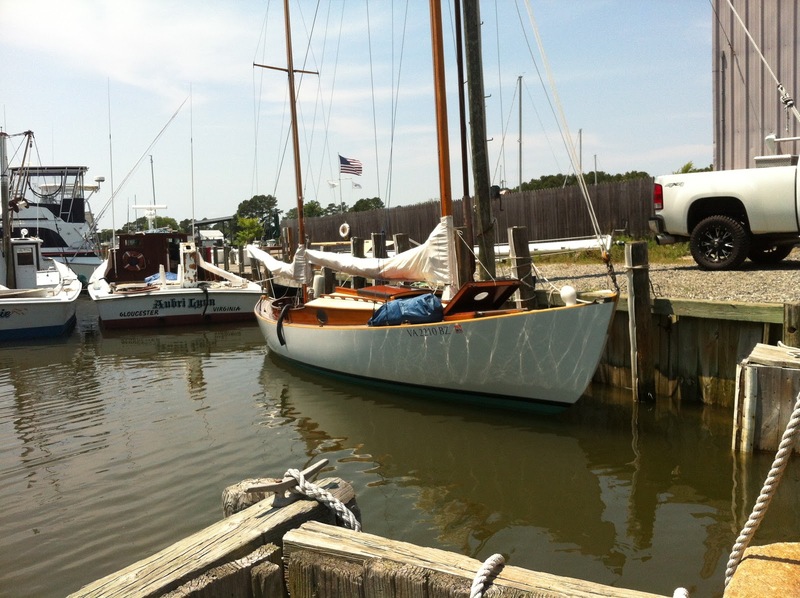 Her time in the yard at Crown Pointe Marina in Gloucester, VA was a short 10 days from arrival. The yard manager Josh was very accommodating and service oriented. Refreshing. We shared a few beers, stories and tunes with the several watermen fixing their boats. Luna proved our ticket to this hard working, independent and all-a-round good people. With names like “Kenny Man” and “Rooster”, how could you go wrong? Ice cold Buds, country and gospel music fed our efforts. a fresh bottom in the slings. 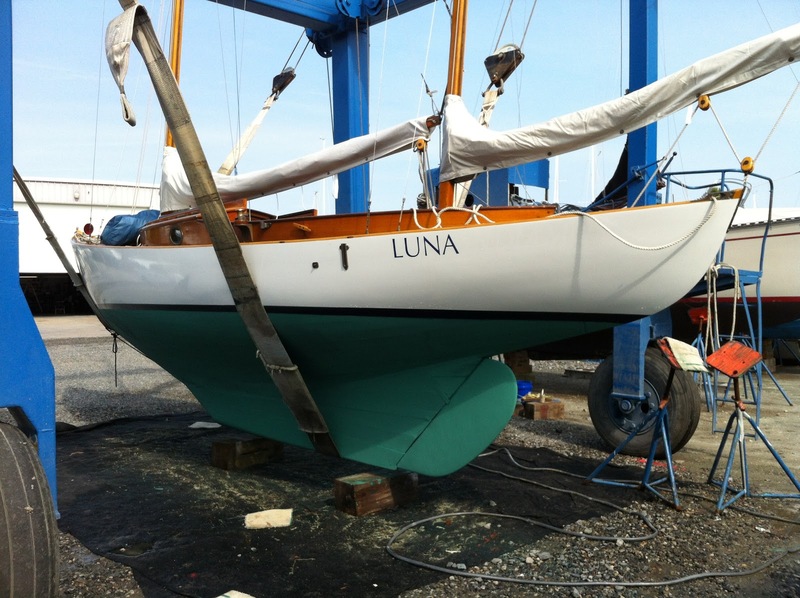 Luna’s seams were reefed, cotton caulked where it looked necessary and seam compounded to receive 2 coats of Petit’s Hydrocoat. This paint is water based and has been well reviewed. 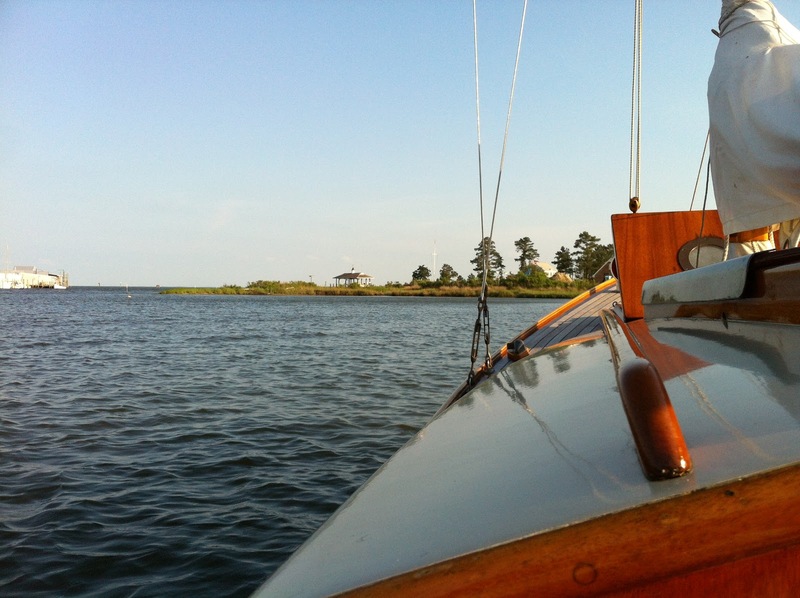 The designer’s father, the Wizard of Bristol, Nathaniel Greene Herreshoff was noted to have said, “There are only two colors to paint a boat – black or white. And only a fool would paint a boat black.” White she is with a midnight blue boot stripe and green bottom. It looks right, a classic Herreshoff color scheme. Luna settled right in with the other purpose built skiffs. 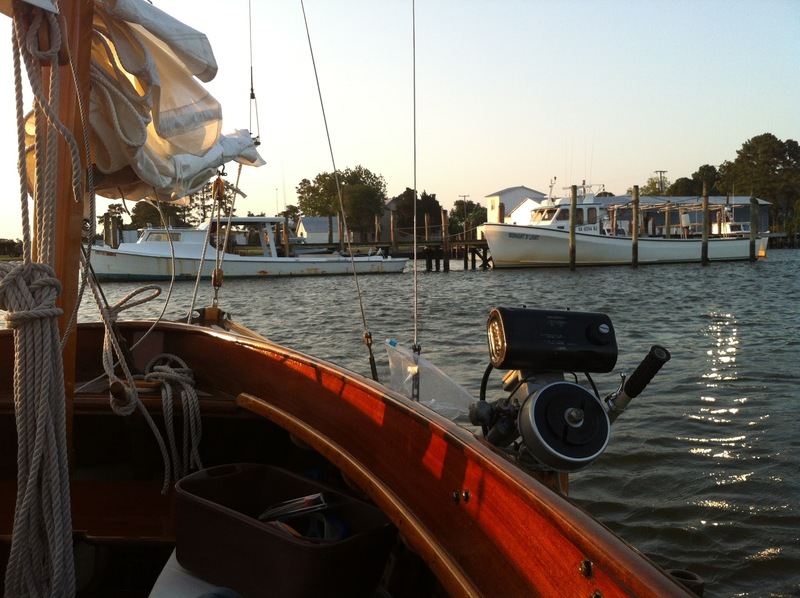 After a few hours of periodic bilge pumping and the early heat in the basin, we fired up the Seagull outboard and motored off the marina to anchor for a nice breeze and sunset. The boat came with a stainless steel folding anchor that I’m told was designed for seaplanes. It features opposing flukes and folding cross bars. The contraption buried well and held through the sustained 25-30 mph winds that brewed later that night. Sunset was accompanied by watermen tweaking their craft’s engines and a group of 3 adolescent local boys practicing their “colorful” language and flips off a nearby pier. A few belly flops and back crashes forced screams of pain to echo across the water. Perhaps it was punishment for their poor choice of words? It was all amusing. a view from Perrin Creek to York River. The morning had started at 0500, the work was steady, dinner brief and sack time at 2130. I slept on a wool army blanket with a light sleeping bag. Without an automatic bilge pump, I woke a few times to pump the bilge. Once when the wind increased to veer 180 degrees and another time at 0300 as a waterman decided to test his engine. He needs a watch. 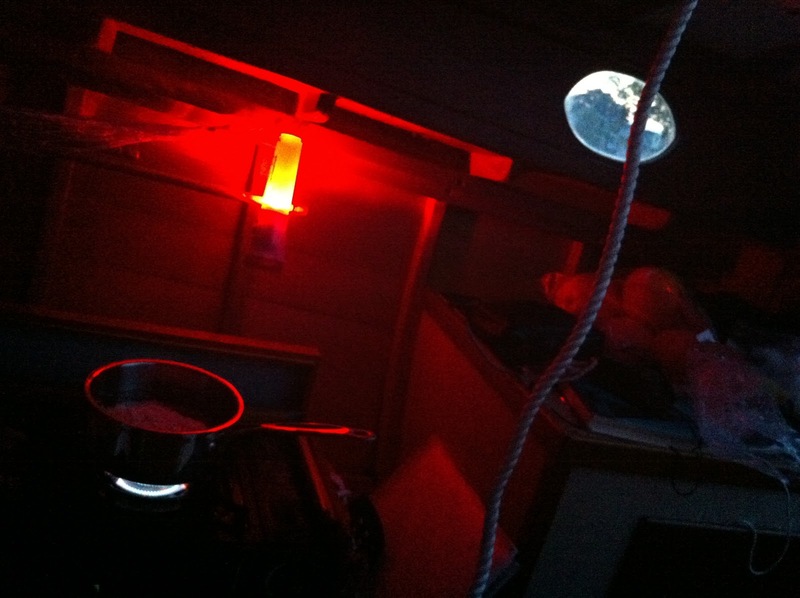 the galley and Top Ramen on the burner. Morning began at 0600. The breeze was a fresh 10 kts from the SSW. Skied was scudded with dark clouds in the west. A bowl left in the cockpit showed about 1 1/2″ of water in it, so I wasn’t so sure how much pumping came from the sea and how much from the skies. A quick inspection showed no leaks in either the deck or chain plates. Nice to see. Without a depth sounder or centerboard I was cautious about sailing out of this shallow creek at low tide. Still, having learned on UNA, we raised and flatten the mizzen, went forward to shorten the rode, raised the jib, and took the anchor aft. Gashing the hull with this menacing anchor was avoided, but seems inevitable in the future. I think I’ll look for another claw as they have served us well. The whole procedure was controlled and Luna very slowly drifted aft until we sheeted the jib and slipped to windward out along the waterman docks. Some fellow yelled across the harbor, “Nice boat!” We waved and grinned. With only jib and jigger, the Rozinante confidently tacked 3-4 times up the channel and out into the York. What looked to be the pilot schooner Virginia was resting along the Yorktown wharf beyond as Luna gathered speed in the building breeze (12-15 mph). 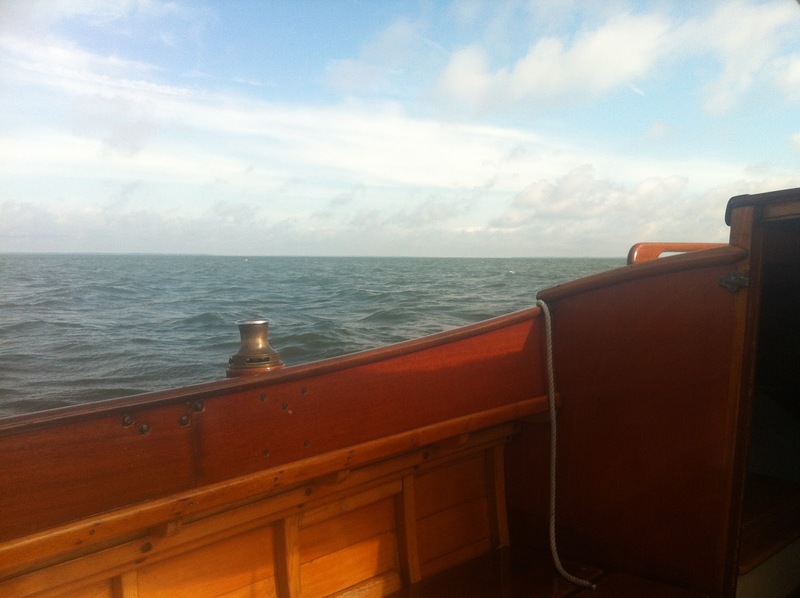 The main hardly seemed necessary as we reached out to Swash Channel. I should have shipped the outboard as it was dragging partly in the lee. 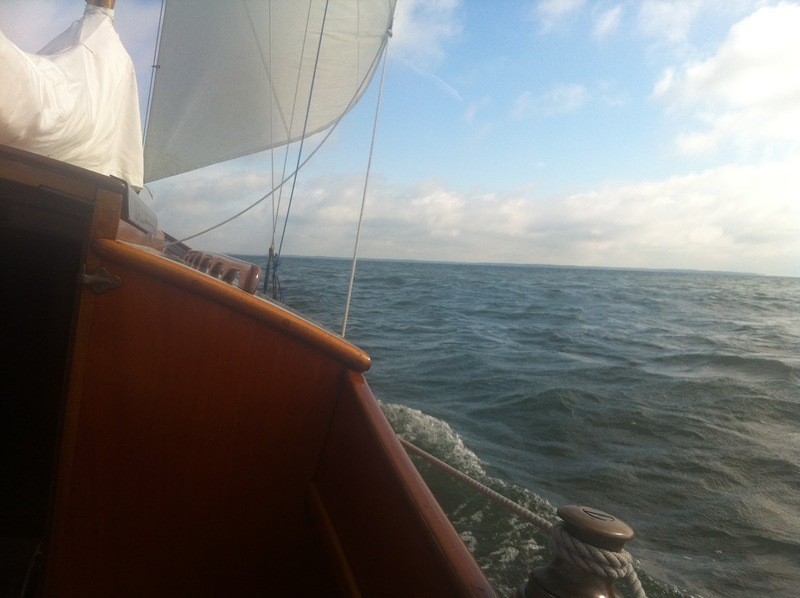 despite that we moved 6.5-7 kts across the bottom on a still outgoing tide. Jibing on the other side of Swash, we rolled across Mobjack Bay into East River as winds built to 18 mph. I was really enjoying this little sea boat. Her tracking with a full keel amazed me. She darn near sails herself downwind! The last bit of a sail always seems the sweetest and as Luna approached her new marina, this time was even more special. Everything I had read about this vessel was proving true. Her gentle motion, solid tracking, and quickness to power on delighted. The secure cockpit, handy controls and rushing water at arms length exhilarated. There is a short channel into our marina. 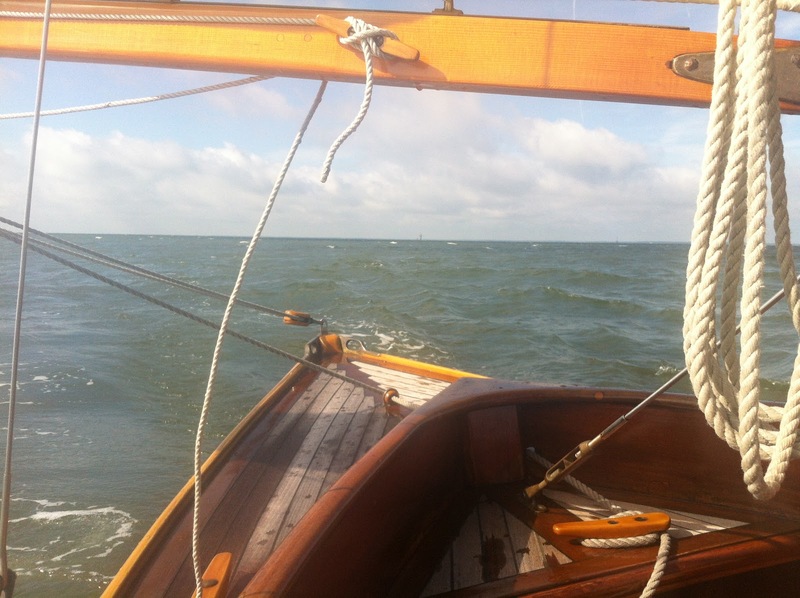 We rounded up, flatten the mizzen again, went forward to drop the jib and set out dock lines. In perhaps 3 minutes time, the boat hardly dropped back a full boat length. What a lady. With a single pull, the Seagull fired up and we crept into our new berth. What a morning. What a boat.